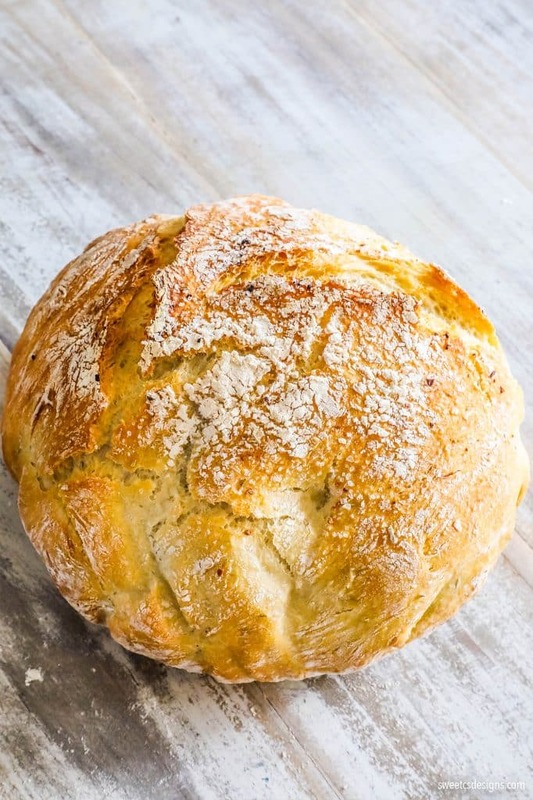 Easy No Knead Bread is a simple, foolproof way to make bakery style bread at home in a dutch oven without any bread making experience or special equipment – no kneading required! Simply mix and let rise for bakery style bread at home in no time! I don’t know why bread making is one of those endeavors that will always intimidate me. Baking has never quite been my thing – I am a decent baker, but I am more a toss ingredients in without making precise measurements kind of person – and I hate following rules. Bread, however, requires a lot of rules and a specific process – which is just not the way I instinctively like to cook. 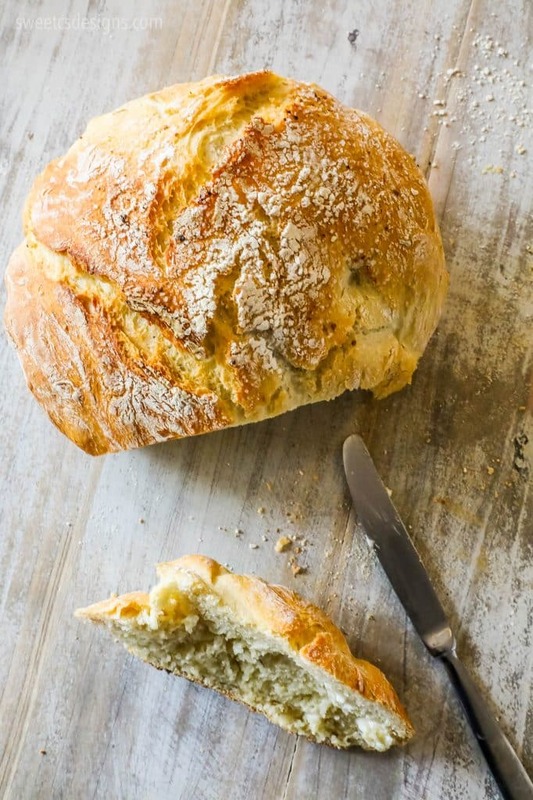 Thankfully, this easy no knead bread recipe is crazy simple, and SO easy! This Easy No Knead Bread, however, is totally a game-changer. Seriously – Artisan No Knead Bread – right at home in your own kitchen! It does take a little time for things like rising, but nothing that is incredibly labor intensive, and is an incredibly easy way to make quick, delicious, and incredibly flavorful bread. 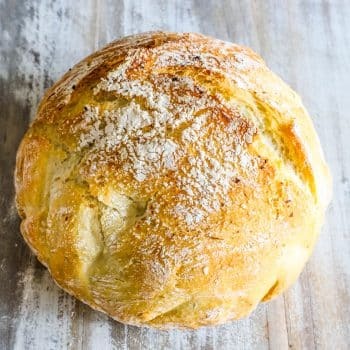 This artisan no knead bread recipe also is a simple mix by hand or spoon bread technique – no stand mixer required! 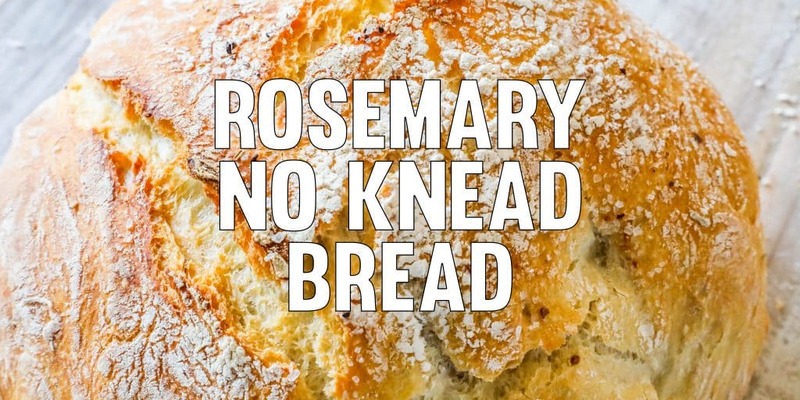 It is loosely based off the famous NY Times No Knead Bread recipe that was a massive hit – with some of my own flavors and modifications added. While I used rosemary (one of my absolute favorite herbs ever), you can use any herbs to make this bread your own. It’s so simple – there are so many delicious combinations you could add in! Be sure to check out my other No Knead Bread – full of Jalapeno and Cheddar goodness! Click here for my Easy Jalapeno Cheddar Bread recipe. This bread is my new favorite thing to bake on the weekends – you can even prep it the night before and let it rise. I’ve had a few people ask what they can use if they do not have a dutch oven. Since this bread is no-knead, it’s really relying on the heat of a very hot dutch oven to help make it light, fluffy, and airy (instead of a gummy, dense bread). If you don’t have a dutch oven, you could try this in another heavy pot with a lid, but I really think for the texture to be perfect, it does need the extra heat. If you love this easy, effortless bread, be sure to check out my other everyday extravagant recipes! Restaurant quality, at home! If you love this Easy No Knead Bread Recipe as much as I do, please write a five star review, and be sure to help me share on facebook and pinterest! 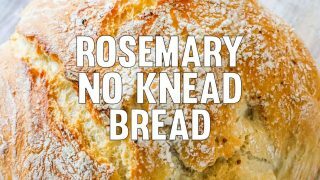 Rosemary No Knead Bread is a simple, foolproof way to make bakery style bread at home in a dutch oven without any bread making experience or special equipment - no kneading required! 1 tbsp celtic sea salt, optional, but great sprinkled on top for extra crunch. In a small bowl, add water and stir yeast packet in (make sure water is warm, but not too hot - if it is too cold or too hot it will not bloom properly). Let yeast bloom for about 5 minutes - it will have a light foam on it. In a large bowl, mix dry ingredients with a spoon. Make a small well in the middle of the dry ingredients, and when yeast is proofed, slowly pour into dry ingredients. Mix by hand (either with your hands, or a spoon). The dough will turn begin to come together and pull away from the bowl. If the dough is too sticky, add more flour in small increments, about 1 tablespoon at a time. If the dough is too dry, add more water, 1 tablespoon at a time. Once the dough has come together, cover it and let it rise until it doubles in size (about 1.5 to 2 hours). 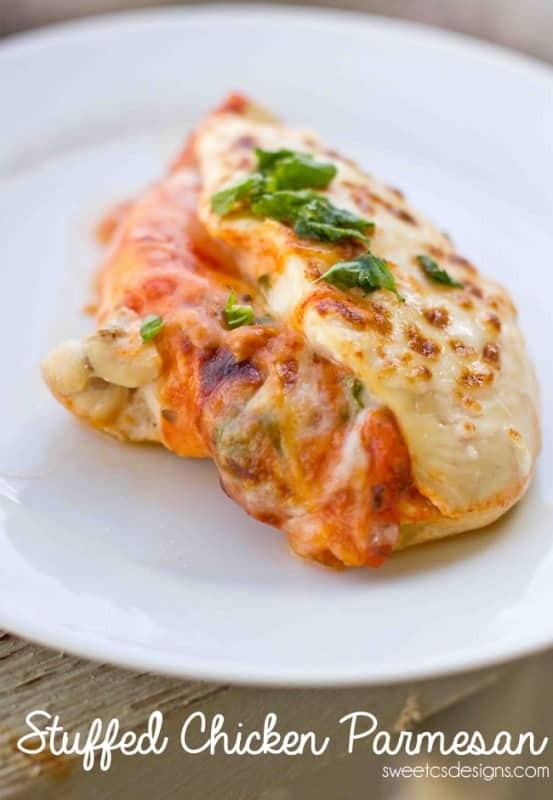 Uncover the dough and give it a few pokes with your finger. If the dough has risen correctly, it should indent under the pressure of your fingers and slowly deflate. Place back in bowl, cover, and allow the dough to continue to rise for another 1.5-2 hours. Preheat oven to 450 degrees (230 degrees C, gas mark 8) and add dutch oven to it, (you want it to be incredibly hot). Generously flour a sheet of parchment paper; transfer dough to parchment and, with floured hands, shape into a ball. Place dough on parchment paper and sprinkle top lightly with flour. 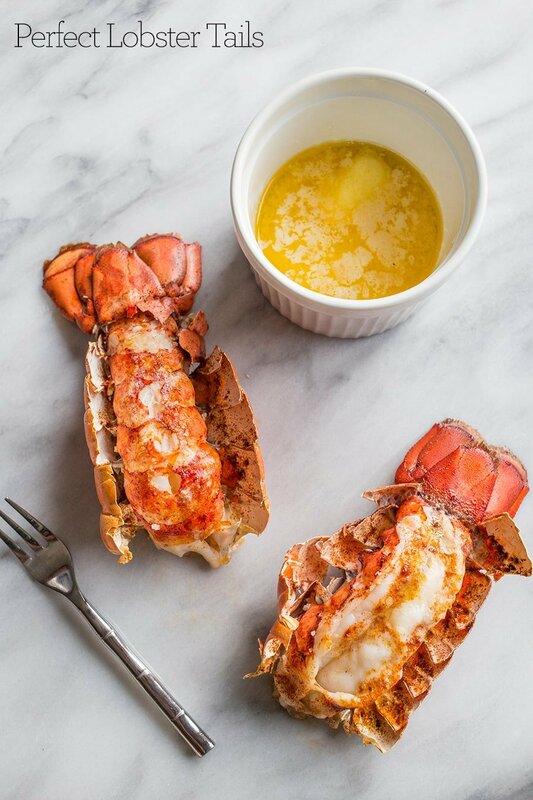 Top with any extra herbs or a sprinkle of celtic sea salt. Top with a sheet of plastic wrap and let rest 30 minutes. Remove Dutch oven from oven. Uncover dough and carefully transfer to Dutch oven, with or without parchment paper beneath (if bottom of Dutch oven is not coated with enamel, keep parchment paper beneath dough- I always use parchment paper because it is just the easiest and I never have to worry about anything sticking). Cover Dutch oven with lid and return to oven. Bake bread 45 minutes covered, then another 10 to 15 minutes uncovered until dough is baked through and golden brown on top. This is absolutely amazing bread! So easy and so delish but I question the nutritional info. 2000+ calories per serving? 200+ grams of carbs? This cant be right. Hi Jane – It isn’t right. I use a software that auto calculates nutritional info and something definitely went wrong. That is the total count for all the bread, not per serving. Software sometimes goes haywire, whoops! 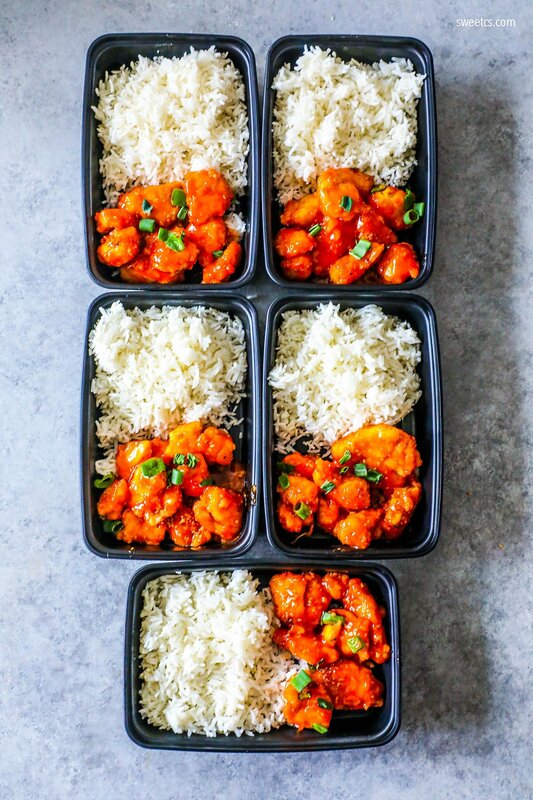 So delicious and easy! A little time consuming with all the rising, but so worth it. The only problem is the salt content. One and a half tablespoons is waaaaaaay too much. I’ll be cutting that down next time I make it, but there will definitely be a next time! Thanks for the awesome recipe! I will definitely make this bread again and it was very easy! The outside is like crunchy chewy and the inside is moist and chewy with lots of air bubbles. I was surprised by how much it raised in the oven; I was skeptical when I put it in and it was only like 1/3 of the way up to the top of the pot but when it was done it had filled almost the entire pot. It’s also very pretty so it’s something I’ll make for gatherings. The 1.5 tablespoons of salt in the dough was too much for my taste, so next time I’ll probably use about 2 teaspoons. This is probably personal preference so try it and see if you like it I suppose. I did crack some salt and added some sesame seeds over the top because I love breads like that, so maybe between the salt in the bread and on top, it was too much for me. Either way, it’s a must try. Can I make it in the crock pot as well? 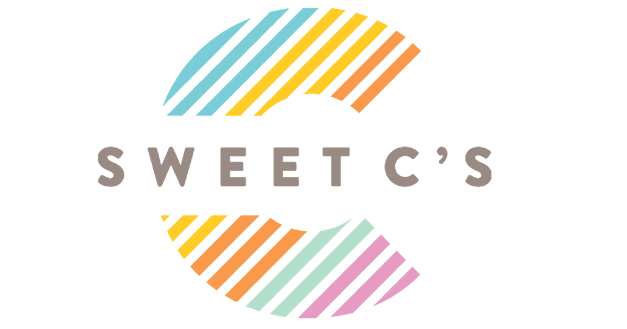 Silke – I am still testing the recipe in the crock pot for the perfect temp. So far, I have found the slow cooker to simply not be fast enough to get a lovely rise on the bread – its all so dense. But I have high hopes for my Instant Pot, and will update if I can crack it! What size cast iron pot? I think I will purchase one, but I noticed the sizes range from 24 oz. to 3qt. to 7 qt. Do you recommend only cast iron or does aluminun work as well? Thank you! Lee- I’d go for a 6-7 qt so you can use it for all sorts of meals (soup, chili, whole roasted chickens, pot roast, etc) – and I think an aluminum one will work just fine! I can’t wait to try this recipe! My dad used to make bread every year in the Fall. He’d open windows and the neighbors would come by hoping he’d give them some too! I do have one question. You say to take the dough out of the bowl and then put it back in again. You don’t do anything to the dough besides just poking it once? Thank you so much for sharing with us! What can you use if you don’t have a dutch oven? Any kind of heavy pot with a lid that is oven-safe – you want to have the steam help the bread rise, so a lid is pretty important. Great bread! Thanks for the easy recipe. I thought I messed the whole thing up every step and then it came out perfect! Do you know how I could make a sourdough version of this? My mom has an amazing sourdough recipe that has been great for her – I have totally struck out with it so far (I am at high altitude in Colorado and am having trouble with my starter- she’s in Baltimore and doesn’t have the altitude issues.) I almost have it down – when I do, I can let you know? Because I am DYING for a version too!!! Sourdough is one of my favorite things on earth. Yes, please let me know! I am obsessed with making bread, even though I am terrible at it, and I would love to try a sourdough! I am at sea level so the altitude would not be an issue. Totally! You can use another herb, or nothing at all! 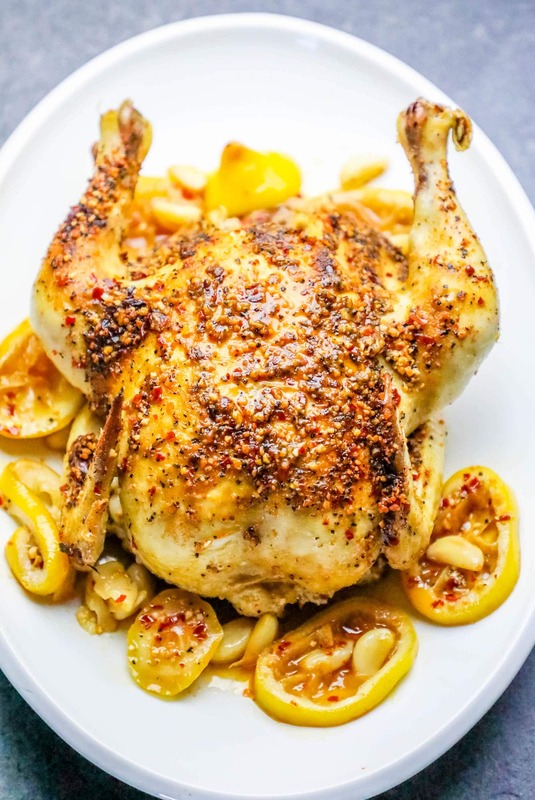 I love rosemary so I add it, but this is a great base recipe that you can adapt to anything you love! I’m a bit confused. Do you let it rise twice? Is the rosemary fresh or dried ? I used dried – but fresh would be fantastic as well. It is a pretty adaptable recipe – so you can use any type of herb you love! What temp. do you set the oven? That is the temperature to cook it at. I love making my own bread. Your no knead bread with rosemary sounds so good. As a matter of fact, I just had a similar bread last night at a restaurant. I am going to try yours.